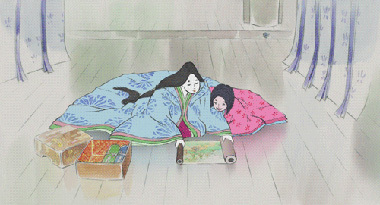 It's been a while since Isao Takahata last made a film: in fact, My Neighbors the Yamadas came out in 1999. 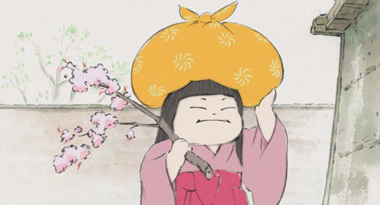 In 2008 it was announced that the famed Ghibli director would create another film, The Tale of the Princess Kaguya, and fans began the long wait till it was finished. 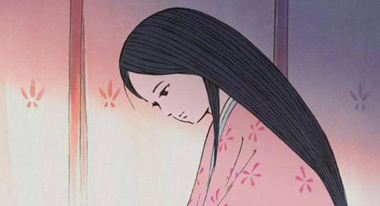 There were bumps and delays along the way (Kaguya was originally intended to be released as a double-feature with Hayao Miyazaki's The Wind Rises, but was pushed back). 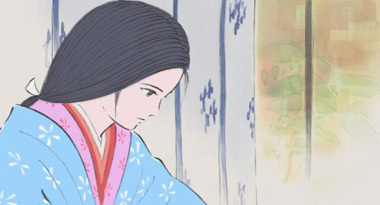 Now, Takahata's tour de force has been finished... does it live up to the hype? Kaguya opens with an elderly man trekking through a thicket of bamboo, harvesting early in the morning. 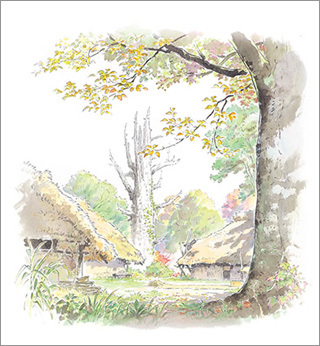 Takahata's film, as you may have guessed, is based upon the Japanese folktale The Tale of the Bamboo Cutter, and the man finds a young, tiny girl inside a glowing bamboo shoot. Taking her home to his wife, the two raise the girl as their own, and watch her grow at an accelerated rate as she encounters the world at large. 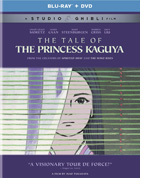 Before even diving into the film, take note of the simple change in the tale's title, from: "The Tale of the Bamboo Cutter" to "The Tale of Princess Kaguya;" Takahata immediately clarifies that this film is certainly about Kaguya. This isn't really a surprise, given Ghibli's history, but it sets the tone for the rest of the movie. 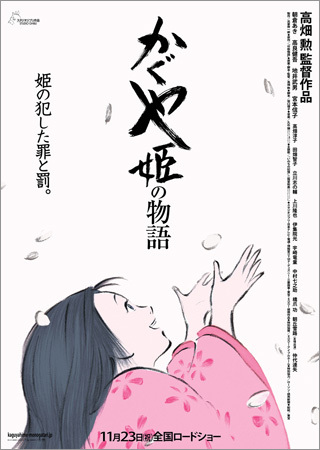 Much of the first act is centered around Kaguya's young life. As she rushes through her childhood, tumbling from rock to bramble, her love of animals and nature shines through. This only makes it more heart-wrenching when she's brought to the capital in hopes of a better life. Yet, Kaguya's adoptive father struggles with the best way to make her "happy" (bringing her garments and teaching her how to be a lady), while all along the way ignoring the things that really do. However, she doesn't take this ignorant love laying down, and instead carves out her own path within the walls her father erects. Yes, don't worry: she's still a Ghibli protagonist, through and through. Kaguya exudes a confidence in herself that affects all around her, pushing against the boundaries of her life. Perhaps the most striking thing at first glance is Kaguya's art style. Hewn in rough, thick brush strokes and painted with soft pastel watercolors, it truly feels like a storybook come to life. The edges often fade to white, as though the current scene is the only thing that exists in the world. It's frankly gorgeous, and one of the most amazing visual styles for an animated film we've seen. You could pause this movie at any moment and always have a perfect painting to frame. 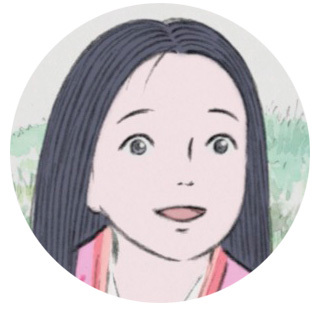 One of the most beautiful scenes in the film features Kaguya running away from the mansion, clothes twirling behind her in a cascading river of rainbow colors as the lineart stretches and skews, tearing apart just like the emotions the princess feels. Stunningly rendered, it imprints upon the audience the turmoil going on in a way a live action film never could, and a great example of animation's abilities and strengths. Joe Hisaishi composes the soundtrack for this film, which is as impressive as usual. The sweeping orchestra is here, as you'd expect, but there's also a strong melody that carries throughout the the film. It never really leaves, and manifests primarily as the song Kaguya sings to herself, making it more memorable than usual. It's a strong output from Hisaishi, perhaps even one of his best. 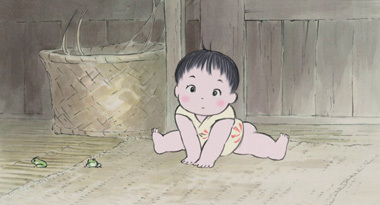 We waited so long for a new Isao Takahata film, but somehow it was all worth it. But how could anyone ever doubt the cantankerous old fellow in the first place? Ghibli isn't fading away on the wind, but instead going out with a bang! 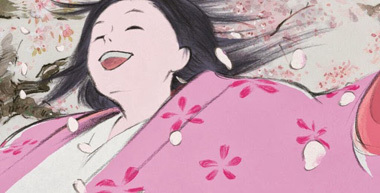 Through strong storyboards, fluid animation, and compelling performances, Kaguya tells a heart-wrenching tale that's also one of the best examples of animated art out of Japan in recent years -- creating a classic combination that'll be remembered forever. 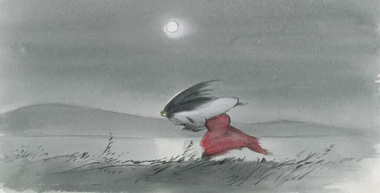 Below: Scenes from The Tale of the Princess Kaguya. 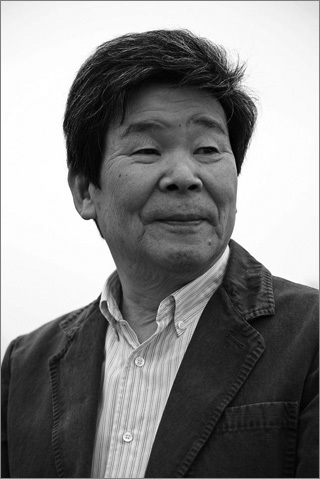 Below: The official poster from the film and a photo of Isao Takahata.